About 11.30 a.m. Friday 13 July 1979 Detective Lane accompanied David Bernard Chapman an 18 year old car theft suspect, to a disused bus parked in a camp site at Kyalite Southern New South Wales. 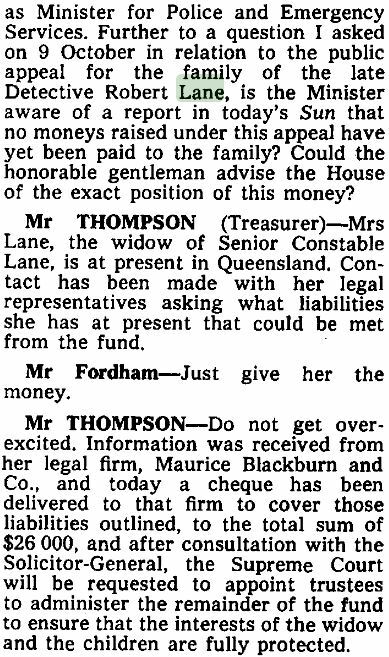 Chapman had been living there for a short time and had told the Detective he had a receipt amongst his possessions which would exonerate him of the theft. Whilst Lane searched the bus Chapman took out a .22 calibre rifle and shot the Detective in the head. The policeman fell to the floor and Chapman then walked up and again shot him in the head. He then dragged the corpse to a nearby pit where he dumped it. He then escaped in the police car in company with his 17 year old girlfriend Kerryn Anne Bonser. He later dumped the police car in the Edwards River 5 kilometres away and took to the bush. 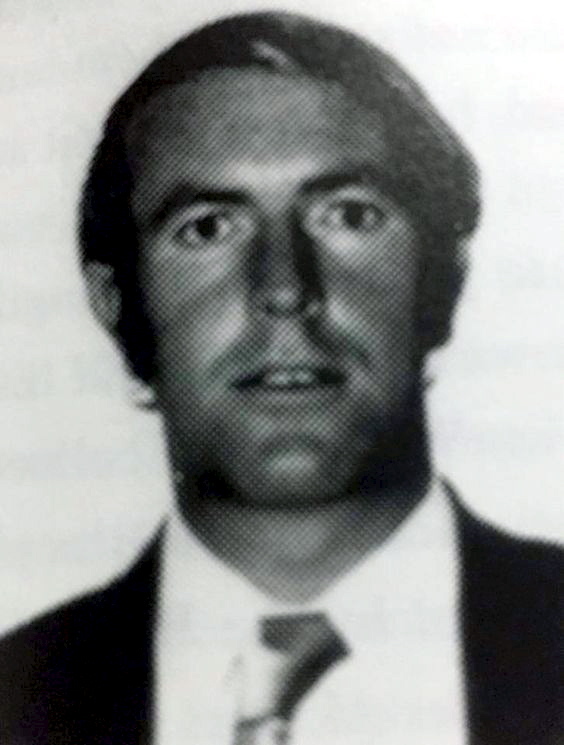 Despite a massive man hunt Chapman was not located until 19 July 1980 at a property in the Kyalite District. He admitted his guilt and appeared before Parramatta Supreme Court charged with the murder. On 1 July 1980 he was sentenced to life imprisonment. In late 1964, Harris completed one of the game’s most audacious coups when he landed Ron Barassi as captain-coach. The Blues then entered what would be arguably their greatest era. These were glory days for Lane, who in November 1965 earned an on-the-record endorsement from Superintendent Gilbert Trainor after graduating as a policeman. Superintendent Trainor described Lane as a “sound, reliable type who applied himself diligently and obtained good results”. Lane’s senseless murder on the morning of Friday, July 13, 1979, made front-page news, which resulted in the swift apprehension of the perpetrator. 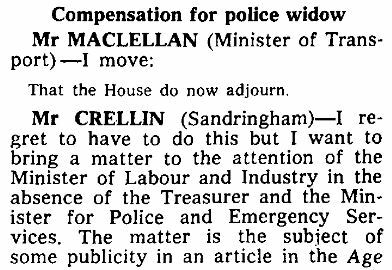 But what appears to have been lost in time is Lane’s standing as the only league footballer to have died representing the Victoria Police. 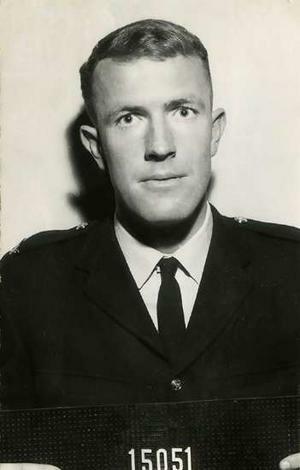 Retired policeman Gomer Davies, who lives in Lalbert, near Swan Hill, said Lane was stationed in Carlton when he embarked on his league football career. “Carlton (Football Club) got Bob down at the time he joined the police force and he played a couple of games there,” Davies said. “He was a handy, but not great, footballer and he seemed to be a fairly quiet type,” Collins said. “I remember that he used to turn up to training in his police uniform. It’s just on 40 years since Lane took the field for the Blues. He was the first to carry No. 46 into a Carlton senior game. In his first game, Lane was named 19th man, with Jim Pleydell joining him on the pine, while Richard Vandenberg (a distant cousin of the current Hawthorn captain), made his senior debut that day starting in a forward pocket and exchanging roving duties with Adrian Gallagher. Lane and the likes of fellow country recruits Ian Nankervis, a namesake of the former Geelong player who hailed from Mildura Imperials, and Gil Lockhart, from Mansfield, were turned over by Barassi during the 1966 season. According to Vandenberg, who is now a chartered accountant in Swan Hill, the die might have been cast for Lane with the arrival of the lanky Tasmanian ruckman Peter “Percy” Jones. Then in 1973, Lane returned to the big smoke, renewing acquaintances with Davies at Russell Street. “He was a senior detective at that stage and he was also playing for ‘Willy’ at centre half-forward in the old Channel 0 days,” Davies said. Davies was then left with the terrible task of recovering his mate’s body from a roadside camp by the Wakool River. It has not been lost on the club, either, with chief executive Michael Malouf confirming this week that Carlton would work with Victoria Police and the Blue Ribbon Foundation to honour Lane’s memory. 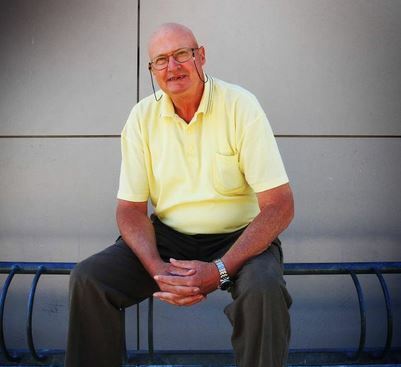 Richard Vandenberg said: “A lot of former players who didn’t make it went on and contributed to local communities because of the league football brushwork on them. Bob was a great leader in bush football — hard but fair, and dedicated to the sides that he coached — and the country people with whom Bob spent most of his time always appreciated it. BRETT Bellis, who retired from Quakers Hill police after 41 years of service, is a walking encyclopaedia of major crimes in NSW and Victoria. He rose to the rank of inspector and was involved in most of the major cases that made headlines from 1971 to 2011. They included the murder of anti-drug campaigner Don MacKay in Griffith in 1978, the kidnap and murder of Renee Aitken, 5, in Narooma in 1986, and the arrests of Daniel Bernard Chapman for the killing of Detective Robert John Lane in 1980 and of Andrew Mark Norrie, who killed two men in 1986. Mr Bellis said that among the worst cases was the killing of Michael Lewis and his wife. He said the killer left their children, who were aged two and three, near their badly decomposed bodies and that they were there for several days until they were found. Mr Bellis, who is now a grandfather of one with another on the way, said he could never completely forget some of the other cases either. “But retirement helps, because it allows me to spend more time travelling with my family and playing golf at Stonecutters Ridge,” he said. Mr Bellis was one of about 100 retired police officers and their wives and husbands at Retired Police Day at Quakers Hills and Blacktown on the 150th anniversary celebrations of the NSW Police Force. The officers received commemorative pins at Quakers Hill police station from Superintendent Gary Merryweather and at Blacktown Workers Club from Superintendent Mark Wright. Police Commissioner Andrew Scipione said the day enabled citizens and the current crop of police to recognise and commend the work of former officers.